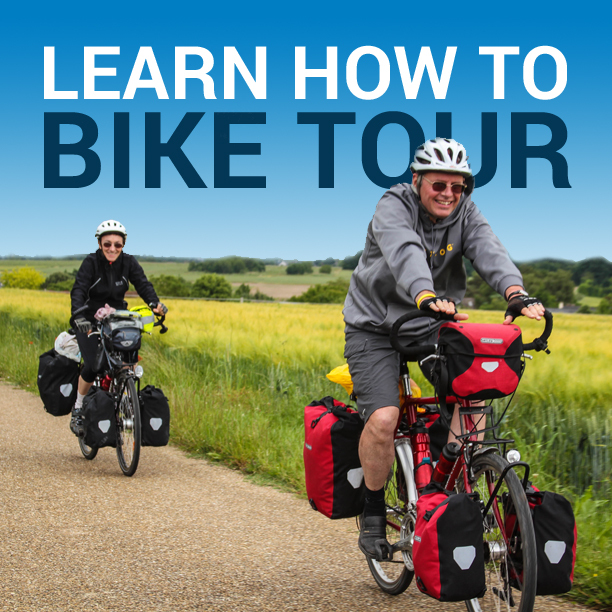 Bicycle touring can be done on almost any kind of bike. After a few 100-mile days, however, having the right touring bike will determine whether your body can live up to the demands of life on the road. That said, the Trek 520 caters to the touring bike scene with its chromoly steel frame that offers the perfect mix of flexibility, comfort and durability needed for long-distance bicycle touring. The stretched out geometry is just right for staying comfortable on the bike and at the same time allows you to get in a good aerodynamic stance for optimal speed. The 520 is perfect for long-distance bicycle tours or for the daily commute. Its classic touring geometry has stood the test of time and is considered a cult classic by many. Having been around since the 1970’s, The Trek 520 has earned its place in bicycle touring history. Trek only offers one touring option – the Trek 520, which is altered each year with a new paint color and exterior design. While the paint may change, the components haven’t varied too much throughout the recent years. The Trek 520 MSRP is set at $1,429.99 USD. It comes in five different frame sizes: 48, 51, 54, 57, 60cm. I am 5’8” with a 30” inseam and the 54cm fits me perfect. The wheel set on the Trek 520 is durable and able to take a heavy load even on mild trails, with Bontrager Race Lite Hard-Case 700x32c tires that are wide enough to add cushion yet able to keep good speed. The bike also comes with a Bontrager Back Rack Deluxe (a rear rack) that is good for loads lighter than 20lbs. The stock brakes hold their power and are able to stop your fully-loaded bicycle, even when traveling at high speeds and in downhill scenarios. I went about purchasing this bike first by spending a good amount of time researching touring bikes online. 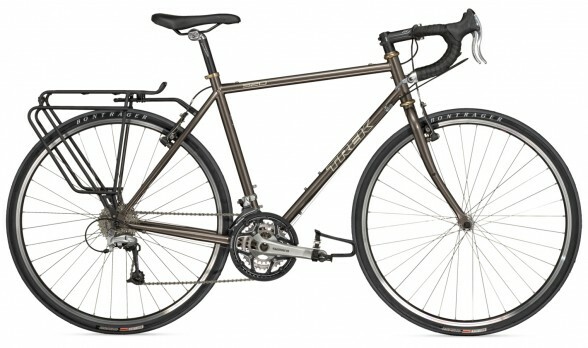 After hours of research I had narrowed my choices to the Surly Long Haul Trucker and the Trek 520. My next step in purchasing the bike was trying to find a store that had one of these bikes in stock to test drive. I could not find any local stores that had the Surly Long Haul Trucker in stock. I quickly discovered that touring bicycles can be hard to find in many local bike shops. After calling about 20 stores that carried Trek bicycles, I came across Helen’s Cycles in Santa Monica, CA that stocked the 520, and it just so happens they had my size! I took the bike for a test drive and loved the comfort and stability of the bike. I was sold! I was able to pick mine up in 2010 for just under $1,050 USD (including tax) due to some minor chips in the paint on the top tube. The suggested retail price of the Trek 520 is a little steep in my opinion, because there are similar bikes of similar quality that sell for less. However, the 520 is specialty bicycle, which somewhat justifies its price. I purchased my Trek 520 in the spring of 2010 with plans to use it as a touring bike, road bike and commuter. I had never owned a road bike before, as I was mainly an avid mountain biker at the time, so the Trek 520 had a completely different feel for me. After a few longer rides, however, I was hooked! I loved that I could cover 50-80 miles in a day without being exhausted. After many long rides to train for my month-long Canada tour that I did in the summer of 2010, I invested in some upgrades. While the bike is set up for touring, I made some upgrades to meet my specific riding/touring needs. The biggest upgrade for comfort I have made was the saddle. The Trek 520 comes with a decent stock saddle, fine for 60-mile rides, but after doing a few 80-100 mile days in a row, I decided an upgrade was a worthy investment. After doing my research I decided on leather Selle An-Atomica. It is the best seat I have ever sat on! After proper adjustment and wear-in it feels like riding on air. Soon after that I added Shimano 520 SPD pedals. Next, I installed a set of Kevlar lined Schwalbe Marathon Plus 700 x 35c tires. With the new tires I have only had one flat in 3,500 miles. My friend bought the same tires for his Cannondale touring bike and was able to ride over 6,000 miles on one set before replacing them. I also upgraded the stock fenders to SKS fenders. They give a lot better coverage for riding in the rain and dusty conditions. The stock rear rack is good for carrying 20lbs or less. I carry my tent and all my gear on my bike while touring so I decided to upgrade to an Axiom rear rack and purchased Axiom Low-rider front racks to carry my 35-40 lbs worth of camping gear and clothes. To hold my gear I invested in the Axiom journey series panniers – front and back. Everything mounted very well, and the bike has sufficient braze-ons and welds for mounting heavy duty racks. The one upgrade I have always thought about is lower crank gears. The stock gear ratio of 48/36/26 is a little high if you are using the bike to carry heavier loads on longer trips with mountains. My full load including the bike weighs in at close to 70lbs, while the bike itself weighs in at 27lbs. On long mountain passes, it sure would be nice to have a lower gear to switch into. If I had to say one thing negative about the bike, I would say the paint job is not without its flaws. In 2010, when I purchased the bike, a rusty root-beer color was the only color option. For some, the color along might have been enough to turn them away from the bike. The brownish color of my bike has grown on me, however, and the metallic brownish/orange high gloss paint really stands out in the sun. The problem that I have noticed, however, is that the metallic paint chips off easier than any other bike I have ever owned. An easily chipped paint job, of course, is not what you want in a touring bicycle that can be exposed to the elements for long periods of time. While the paint may be chipping, there isn’t a single spot or chip that has started to rust. You should also remember that the current models paint is different and I have not heard if it still suffers from paint chipping. Would I Recommend The Trek 520 Touring Bike? I would highly recommend this bike if you have the money to invest, and are serious about bike touring. You definitely get your moneys worth. The bikes durability, style and comfort definitely justify the price. I also get comments on the style of the bike frequently; a lot of people enjoy the classic look of it. This is the most comfortable bike I have ever ridden. The steel frame and geometry of the bike minimizes the bumpiest of roads and can take on some mild dirt trails – even when fully loaded. The Trek 520 is capable of holding a lot of weight, taking a beating and coming out like a champ. I have almost 4,500 miles on my 2010 Trek 520. Other than re-greasing and tightening the bottom bracket, new brakes, new chain, basic maintenance and tuning, it rides just like the day I bought it! Looking back I have had no regrets or any major technical issues with the Trek 520. I have also yet to come across any major complaints from fellow bikers that own this particular bicycle. On a Scale of 1 to 10, I would give this bike a 9. The durability of the paint and the fact that the bike is slightly overpriced when compared to similar bicycle models are the only things holding the 520 back from being a perfect 10. The Trek 520 is and will continue to remain a classic choice in the bicycle touring world. This entry was posted in Bicycle Touring Pro Articles, Bicycles, Featured Articles, Main Articles, Product & Service Reviews, Products and tagged touring bicycle, trek 520, trek 520 craigslist, trek 520 for sale, trek 520 review, trek 520 touring bike, trek 720, trek review, trek touring bicycle, trek touring bicycle review. I too have a 2003 520, has been an awsome bike…lots of miles touring with 0 problems. Great article! I also love the 520, but there is or was for me toe wheel clip or what ever we call it when your shoe’s clip the front wheel…what do you think about using butterfly handle bars on the 520, with a 650 wheel you can add a little wider tire? Rodney, I’m not quite sure I understand you. Are you saying that when you ride the Trek 520 that the front wheel clips the front of your toes when you turn? If so, that could indeed be the right of the bike… or it might just be the way you have the toe clips set up. As for butterfly bars, this is a personal decision and it is quite a lot of work to change out the handlebars on a touring bicycle like this. If you want to make that change, then yes, it can be done. But the drop bars that come on the Trek 520 are great in my opinion and most people will be quite happy with them. I’d really like to get one of these for my own touring but they don’t seem to be available in the uk? It may be a good touring bike but as any Trek it is just ridiculously too short for tall people. I am 6.8″ and I would never buy Trek (except for Garry Fisher of course – shame they have a Trek label on it now…). So if you look closely you will see that the geometry of Trek bikes is really stupid where the tall people are concerned. They make some bikes up to size 25″ but still only about 10 cm longer then the 15″ version – what is that about. Plus you end up paying too much for the label, I’d rather go for Surly or something else. I have enjoyed my 520 since 2010. I tour about 6,000 miles a tear and the 520 is very dependable and comfortable. The only negative has been the 3rd bottle holder. When you add the detachable fenders the 3rd bottle holder cannot be used because it hits the fender. I have recommended the 520 to others but it can be difficult to find in stock. Most bike stores want you to purchase before they order….without a test ride. If you do not like the bike you are stuck with it or you can return it but you are committed to buy something else. Wow, thanks for your help there was actually a dealer 2 miles away. Going to make a trip down tomorrow. “there are similar bikes of similar quality that sell for less” could you name some of them for us, the budget tourers? 🙂 I’m currently touring on an aluminum trek 7.3FX, is steel really much more suppler than alu? Nice review. I picked up a 2010 520 (barely used) this March and put 1200 miles on it over the summer. Never a problem. I really like the metallic root beer color and haven’t had the chipping problems you experienced. The bike rides smooth and shifts smooth. I also put SKS fenders on mine as well as a Brooks B-17. I’m still on the Bontrager Hardcase Race Lite tires that came on it and have not had a flat yet. The updated gearing has the granny necessary for the steep 13-14% grades that we routinely face in our area. The longevity of this particular model speaks volumes. Maybe more have crossed the continent than any other single bike model. The Trek store sized me and sold me a 57cm Trek 520. They said I was borderline between the 57 and the 54. After 3 years I have to say the bike is too small. I’m 5’9″, and to get it to fit right the seat has to be way up, and Trek had to order a new uncut fork to get the handlebars way up – to get almost level with seat. It looks funny. Another local bike store, that does not sell Trek, told me it looks too small. REI put my wife, at 5’4″ on a “medium” Novara Randonee touring bike (often compared to the Trek 520). Her bike is bigger than mine! I think Trek sizing works for guys with really short legs, and people who like that “seat post up in the sky” look you see with racers. The old Trek 520s, with less compact geometry, look far better to my eye. I’ll probably swap the parts to another frame. Big $ loss. Other than that, it’s a great., flawless bike. I just bought the 520 and I did a lot of research before I made the purchase. I will stay in touch with all and tell you my thoughts as soon as get the bike this sunday. I bought the Trek 520 this year for a 3 day tour through the Rockie Mountains. The bike performed well and was able to carry my 20 lb. panniers with ease. The steel frame was heavier than my other bikes but did not feel heavy riding. The smaller frame size fit my short torso although I had to raise the seat quite a bit for my long legs. That being said the 520 is the most comfortable bike I have ever ridden. I purchased my Trek 520 about 20 years ago and used it for many touring trips. I have always taken good care of it, and today it still remains to be one of my favorite bikes to take day rides on. I paid about $500 for it 20 years ago and has proven to be a great buy. In Europe Idid use for self supporting tours mind condition Cannondale 1000X . My brother try it and he was also hooked … When return to Canada I did buy new Trek 520 . About 20000 miles fully loaded touring on my trusted and comfortable burgundy red Trek 520 was poore pleasure and I do not complain at all. Set up: Brooks , Shimano SPD , Satori stem and stem riser , AC Lowrider , Axiom rack just slightly modified , Voyager heavy duty paniers front and rear + Voyager handlebar bag , ( you do not buy those quality anymore). Czech made Pigeon framebag is superior quality also so by Bilenky Bicycle Work installed S&S couplings for reason . This Trek 520 is last series proudly build in Wisconsin USA . Thanks for the great review and information. The Trek 520 is on my short-list of bikes and this is helping me make up my mind! Wondered if you still have the 520 or gotten rid of it? I see the CoMotion now with S&S couplers. I am purchasing a 520, and building it with components equal to the Americano, along with S&S couplers, a SON28 hub and Luxos U headlight. Your thoughts on this set up? This bicycle review was written by a BicycleTouringPro.com reader named Justin Bernstein. I don’t own a Trek 520 and I never have. You are correct about me owning a Co-Motion Pangea, however. The Pangea is the touring bicycle I have been riding since May of 2012. I’ve never heard of anyone buying a Trek 520 and totally transforming it the way you say you plan to do. It sounds like a lot of work and money. Why did you decided to do this rather than just keep the Trek 520 the way it is… or rather than just buying a touring bicycle with the parts/components that you want? I’d be interested in hearing how that hub works out for you and what you end up charging with it (besides the headlight). This review reads too much like a brochure from Trek, at least the first half. Today’s 520 is a relatively more compact geometry than the original. My 2002 is a completely different bike than the current model in both geometry and stock components. Trek has finally figured out what parts a touring bike should have, however, for years they were putting a standard road triple (52/42/30). While it’s a solid bike, I’m critical of the idea that it hasn’t changed over the years. Also, given this review was written two years ago, I should mention that Trek is adding disc brakes for 2015 (mentioning this for the sake of anyone reading the above review and considering the 520). Where are you getting that the rack (Back Rack Deluxe) can only hold 20#? Trek lists it at 50#. I’ve upgraded to this newer version and I’ve had no issues fully loaded with somewhere in the area of 50# of gear. It’s a well made rack. I purchased a 2013 Trek 520 earlier this year and enjoy riding it regularly. The bike rides smooth and steady and, while not necessarily built for speed, can sail down the road quickly. I chose to replace the stock Bontrager seat with a Brooks Flyer (springed) saddle which is almost broken in now – it works great to reduce road vibrations. I added a Light and Motion headlight for night-time daylight and a Bontrager pannier which easily mounts to and disconnects from the back rack. This is the second Trek touring bike I have owned – I love it! My 520 has over 46k mile on it. It’s a fine bike but I have one beef; the SD-7 brakes that came with it were noisy crap. On a wet loaded downhill I had to reach round to the drops to get any stopping power at all. I replaced the front brake with a Single Digit Ultimate and replaced both brake levers with Tektro RS520 levers. Braking is much better now although I couldn’t launch myself over the bars if I tried, they still require effort but I can now brake from the hoods. If I replace it I’ll get the disc brake version. I bought a new green 2015, without the disc brakes. Love the ride. Very stable. Digging the bar end shifters. I certainly am not doing well with the forward position. I added a Dimension stem extender that raised the bars about 3 inches and that had helped, but I still need a shorter stem. I ordered the Bontrager Elite in the much shorter 7 rise, 70mm. Hope it will take away the pain in the lower part of my neck in back. But if need be, I will add either the tried and true Nitto Albatross I have been using for sometime on a old GT Nomad hybrid, or a set of Jones bars since they are back and will pair well with the stem color. Otherwise, I do hope to make the drops work.. even consider some wider ones along with the shorter stem and any needed stacking like I see on many Surly LHT bikes. Planning a Fit at a bike shop to rule out my options. I currently have a Trek 8000 mountain bike. For riding around town, neck pain is my main complain. I also have a trike that totally gets rid of any seat or neck pain but it is only good for perfect roads. I am considering Trek 520 and would be interested to know about the changes to the stem that you made to get remedy you neck pain. I had similar neck and shoulder pain riding in a peloton with this bike, particularly on roads that are not great quality. The underlying cause was that the hoods don’t have much padding (like most bikes), but you need to rest your hands here to brake or use the drops the entire time. The solution was to install in-line brake levers so I could also brake from the padded handle bars while drafting. The levers were ~$30 and are cheap/easy to install when you are replacing your brake cables and bar tape at the same time. I’ve ordered a 2015 disc model which I’m pickng up this week. Planning an epic tour from Ireland to Turkey and will enjoy training rides around N. Ireland. Slightly concerned about the “small” sizing of the bike but hopeful that the 57′ will fit my 5.10 height. Im planning a long trip to South America, I preffer the less travel or off road path. Im from Colombia and here the obly two touring bikes avaliable are the Giant Thoughroad slr 1 and Specialized Sequoia. Im not sure about this bikes, because the giant have an aluminium frame and carbon fork and the Sequoia have a 48/32 crank. My dream bike is the Surly Troll but is out of my reach. What can I do? It is possible to have a bicycle shipped to you from the United States or elsewhere in the world. It’s just more expensive when you do this, of course. After getting my Surly LHT stolen two weeks before my XC trip… A friend of a friend got me a brand new Trek 520 for a good price. Along with the bike being stolen (I live in NYC), the racks went with it… so two comments I’d like to make. 1. During my 5,019 mile ride, I used the stock rear rack and only the rear rack the whole way to stow everything (panniers, tent, sleeping bag and sleeping mat). Per Adventure Cycling Association, my total weight (bike included) was 89lbs. The only issue I had with the rack was after getting off a rocky road, the rack started to squeak. I simply tightened the screws and no more squeak. So I’d hardly say that was a problem. 2. I believe this was the article that solidified my decision to go with the LHT and Trek 520 was my back up option while I price compared stores in the area. Having ridden both bikes, I would say they are just about the same, comfort wise. Jumping on the Trek 520 for the first time felt no different than the LHT. The difference may be the size and how Trek and Surly measure their frame size. I got them both in a 54 and for whatever reason the Trek felt just a little more comfortable. Whether it’s because it was bigger or smaller by a fraction I am not sure. Anyway, Darren your resources were an incredible help to making me feel comfortable before leaving for my first touring trip. I am not the person to just jump on a bike and leave, so I can’t thank you enough!!! I purchased a 54cm Trek 520 in September of 2015 and have put over 1500 miles on it to date. I ride on my days off and have done two over night trips. The second trip I took was around 110 mile round trip and about 20 miles was gravel roads. I do wish Trek would design the lower water bottle holder so it would clear with fenders. I recently replaced the the tires after four flats on the original tires. Little things I am changing to fit my riding styles to make the bike more comfortable for me. Over all I am very pleased with the bike and am happy with my purchase. I will be using this bicycle on my New Mexico trip in September of 2018. I know this is along way off but I have other obligations that come first. I am however doing small trips here in Mo. and one trip to my uncles in Oklahoma. I am also getting ready to do the entire Katy Trail in Missouri. Other than the flats I have had zero issues with my 520 but I am only 5’8″ and quite stocky . I would recommend this bike to anyone in my size range. I considered the 520 because it was a light touring bicycle and a Trek – however, I opted for a Jamis Aurora (more bang for the buck) and have not been disappointed. I added a front Surly rack and clipless pedals – the bike came with fenders, good 9-speed triple crank gearing, bar end shifters, and a rear rack. When shopping, I noticed many shops in the Baltimore area did not stock steel frame touring bicycles. After riding my touring bike around – I seem to prefer the ride of steel frame bicycles.